A word from Tannins Restaurant & Wine Bar, Tannins offers a blend of old world cafe with a modern flair. 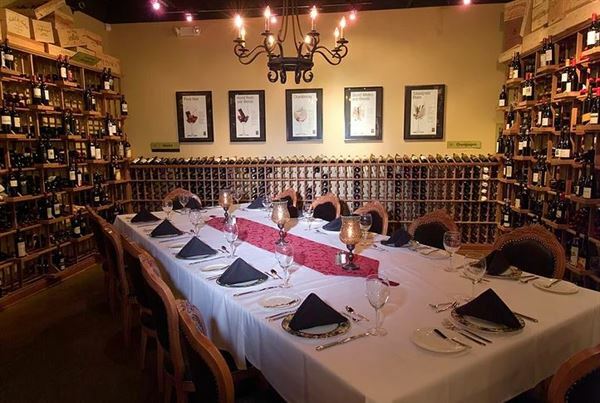 A vast range of both Northern, Mediterranean and Southern Italian cuisine, along with delectable desserts and specials prepared fresh daily.With a strong focus on wine and food pairings, Tannins strives to make your experience both educational and memorable. Tannins also offers one of the largest selections of wine with over 40 different to choose from. Traditional Pizzas 14” Catering Pizzas Pepperoni Pizza......................................................... lrg $15 Margherita Pizza........................................................lrg $15 Three cheese blend, red sauce & freshly sliced roma tomatoes topped with basil. Classic Veggie............................................................lrg $ 15 Mushrooms, green peppers, black olives, onions & tomatoes with red sauce. Sausage & Peppers....................................................lrg $15 Italian sausage, roasted red peppers, fresh green peppers & red sauce topped with parmesan cheese. Spicy Hawaiian..........................................................lrg $15 Canadian bacon, pineapple & jalapeños with red sauce. Meat Lovers..............................................................lrg $15 Pepperoni, Canadian bacon & Italian sausage with red sauce. Signature Pizzas 14” Catering Pizzas BBQ Chicken..............................................................lrg $15 Tender pieces of sliced chicken breast, green onions, chopped roma tomatoes & BBQ sauce. Bianca Chicken...........................................................lrg $15 Creamy white sauce with pieces of chicken breast, chopped garlic, roma tomatoes & mushrooms topped with fresh basil. Tannins Pizza..............................................................lrg $15 Crust lightly brushed with olive oil & garlic, topped with mozzarella, parmesan, ricotta & romano cheeses, red onions & fresh parsley. Gourmet Veggie.........................................................lrg $15 Roasted red peppers, artichoke hearts, roasted red potatoes, spinach, goat cheese, roasted garlic, three cheese blend with pesto sauce on wheat crust, topped with roma tomatoes & parmesan cheese. Italian Delight............................................................ lrg $15 Sausage, pepperoni, roma tomatoes, mushrooms, green onions & garlic with creamy white sauce.